This is a nice yellow slightly almond-flavored cake, a good "generic" cake for your baking arsenal. 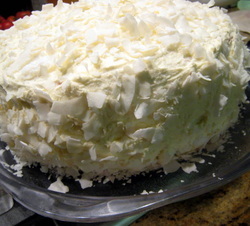 For filling, use the technique for fillings on the actual coconut cake recipe. You can use raspberries, fresh pineapple, maybe even grapefruit or guava or lilikoi if you can find it. Preheat the oven to 350 degrees F. Spray Pam onto 2 (9-inch) round cake pans and dust lightly with flour. Using an electric mixer, cream the butter and sugar on medium-high speed for 3 to 5 minutes, until light yellow and fluffy. Add the eggs 1 at a time. Add the vanilla and almond extracts and keep mixing. In the 'dry' bowl, sift together the flour, baking powder, baking soda and salt. With the blender still on, take turns adding the dry ingredients and the milk to the egg/butter/extracts mix, making sure to start and end with dry ingredients. Keep the blender on a pretty low speed, or you will make a huge mess. Mix until just combined. Pour the batter evenly into the 2 pans. It will be thick, so try to make it flat using a spatula. Bake both on the center rack 45 minutes, until the tops are browned and a toothpick inserted into the centre comes out clean. Let it sit for a few minutes until it's cool enough to touch. Flip the cakes out--be assertive about this as the cakes are pretty sturdy. Cool on a baking rack for 30 minutes. Add you favorite filling between the layers. Frost with whipped cream and serve. 1) I don't buy whole milk. You can substitute 7/8 cup of heavy cream and 1/8 cup non-fat milk, or 1/2 cup non-fat with 1/2 half-and-half. 2) The original recipe used instant pudding for filling. It sounds tempting, but don't do it.